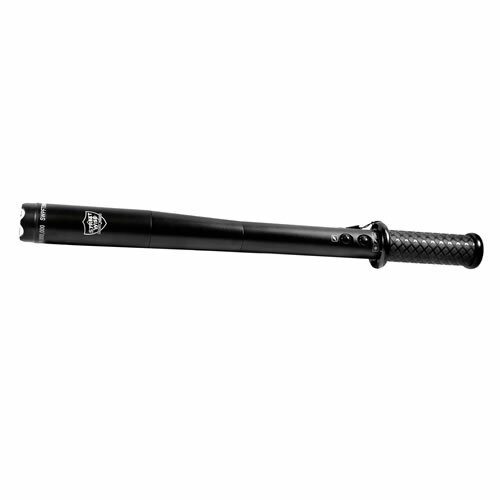 This rechargeable stunning baton is a great protection device for just about any situation. With it's extended reach, this elongated producer of painful energy is powerful and effective at warding off an attack. A display of the sight and sound of the electrical discharge will make someone not want to come any closer. If they do, they get the shock of their life. Shock Sticks are used to ward off an attack and give you time to get away. Military Grade Aluminum Alloy Baton: The shockproof exterior allows it not only to be used as a self defense tool for striking an assailant but it can withstand rugged use and extreme conditions often encountered by the military and law enforcement officers. Powerful: Police Force combines the power of this taser stick with our Triple Stun Technology (TST), the bright and loud electrical burst illuminates the entire top of the unit and will quickly take down anyone unfortunate enough to come in contact with it. Stun Gun Batons are also great for breaking up dog fights or scaring a threatening dog away from you. We get a lot of questions about dog attacks or loose animals while running or walking. This is the device we recommend for that. "Your staff went above and beyond. They (Shannon, the wonderful young lady I placed the order with and discussed the product and another one when I called back to reach my initial contact) were sympathetic to my situation and informative to my questions. She was also speedy in response to my dire need. I am sure you are quite proud of them. I bought the baton so I could break up fights between two large dogs that went from best friends to worst enemy's a couple of weeks ago. Last night – although we have tried to keep them separate – their paths crossed upstairs. The four large boys at home could not break them up and … well it was ugly again. But – I jumped up the second I heard the fight start and ran up the stairs hitting the button on the baton and it's my understanding all stood still including the dogs knowing mama was on her way up with something scary. *Voltage is comparable to other brands that claim to be 9,000,000 volts. An enlarged view of the head. Long Reach: At almost 17 inches long this stun gun baton is long enough to keep you a safe distance away from your attacker but short enough to carry on your belt using the metal clip. I am so happy with this baton-Thank you! It arrived quickly and it is heavy duty! The test fire blew my mind! It seemed to be extremely powerful-My daughter works at java detour and opens at 4am-I feel so much better she can protect herself! There are a lot of stray dogs in my neighborhood, and having a stun baton makes me feel safe and confident while walking my dog. My dog is 2.5yrs old and we've been attacked by strays 4 times in his life time. I have been dealing with TBO-TECH for many years and have several of their great products. The stun baton #SWPFTB9R is my favorite. Originally I bought the baton to defend my yellow lab against dogs off lease, such as Rhodesian Ridgebacks and German Shepherds. Recently we encountered very large raccoons during our walks. My vet told me to be careful, as they carry rabies. As you know, they can severely hurt or kill a dog. Raccoons are not afraid of humans. However at the mere sound of the baton discharge, they turn and run. Thank you Shannon for your kind customer service and care. Several of my friends are now your customer. I offer this review, not as a complainer, but as constructive criticism. I needed to replace my previous well-designed & trusty 18" stun baton that I think I purchased some 5-20 years ago from TBO Tech (not certain?). After a fair amount of research and a LOT of shipping hassle I ended up with the Street Wise 17" baton (SWPFTB9R). So my criticism is that you don't apparently sell the unit that is depicted on the web page discussing stun batons. It is a bit misleading. That said, this new stun stick is extremely clumsy to operate, especially in the "heat of the moment". I suppose the flashlight features are nice, but I bought this replacement primarily for warding off frequent dog encounters during walks with my wife. The multi-function switch is very hard to use in the first place. You have to toggle through as many as 7 clicks (if I counted correctly) to get to the mode that you want........that being the stun mode. I would highly suggest revamping the logic/control on the baton. The on/off switch at the base should be just to power the unit on/off. Then use the multi-function switch to operate just the flashlight modes. And the stun button should be independent of the flashlight and solely dedicated to activate the stun. If you ever offer the stun baton again (as shown at the top of the initial web page) I'd be interested. I purchased this stun baton, due to hearing about all of the pit bull attacks and maulings around town. I walk with my beautiful yellow lab daily and we have had the horrifying experience of being confronted by a loose pit bull at the park. Unfortunately, the loose pit lunged onto my lab and I was very scared she would be mauled to death. Fortunately my lab fought the dog off enough for us to escape. I NEVER want to have that experience again...I had nothing to defend myself with. I was extremely afraid to even walk my dog after that experience, not knowing what I'd do if that situation happened again. Now I have the stun baton and feel much safer, and we are out and about, running the park again. Thank you! I like the rubber grip handle and the wrist lanyard, it works great. I wrap it around my wrist with my hand on the rubber grip, thinking, "Bring it on pit bull!" I'm not sure I'd ever have to actually use it, because when I test fired it, my own dog ran from me and hid behind the chair. It has a pretty scary noise when it's test fired. Hopefully, I'll never have to use it, but I feel so much more safe and confident now that I have this by my side. My lab will also appreciate my ability to protect her from any harm. Thank you for helping me feel safe!!! Purchased this item after having my lower leg mauled by a Rotweiler while my wife and I were walking our 4 dogs. The rot went after me. And our dogs, not being the aggressive type, even though one is a pit mix, did not attack. They responded in a playful manner. Anyway, purchased this for the "next time, just in case". I do know that test firing scares the hell out of the few dogs I have been allowed to fire it around. I do not know for certain that it would incapacitate an aggressive dog intent on doing harm. I hope that we don't find out, but, like I said, "just in case". It is extremely lightweight, comfortable to carry in the hand, and easy to arm and fire. Though I must say that the wrist lanyard is useless. It is not possible to wrap around the wrist and hold the baton in a position to use the two toggle switches that arm and fire. I would not recommend using the baton for striking. It seems as it would probably break in half with very little impact, and it is very lightweight, no heft to it at all. This product gets a recommend from me if you're looking for that "just in case" feeling. Great Product. I bought this product to protect my Yellow Lab and I from large dogs(especially Rhodesian Ridgebacks) off lease, that had been attacking other dogs on lease. Since walking with the Stun Baton, the owners take a very wide birth when they see my dog, on lease, and I approaching. Smaller dogs in Arizona are subject to coyote attacks. This gives me an added sense of security against the coyotes. The sales and customer service were outstanding every time I called. Several of my friends may also purchase TBO-Tech products. I'm just wondering can this be used as a blunt object or will the tazer inside be damage ? I haven't tried this on anyone so I can't tell how effective it is, but it seems to be a good idea to keep at home as a self-defense product. The unit comes with a charger and a belt holster. To test the unit, we must first turn the unit on. The unit will fire when we press the trigger. However, the instruction is not clear as how to use it on an assailant. Here's the quote: "Touch your assailant's body with both contact probes. Touching anywhere on the assailant's body will have an effect." We can assume that the unit must be on before using on the assailant. However, the instruction DOES NOT mention if the trigger must be held down at the same time we touch the assailant in order for the unit to be effective. If holding down the trigger is required then the unit would be quite hard to use, especially when the assailant is a moving target: Since we cannot hold hold down the trigger for more than a second or the guarantee will be void, we have to touch the assailant and at the same moment of less than a second, hold down the trigger. That is fine for an experience law enforcement member, but for common person like me, it is quite impossible, considering how nervous I would be when facing the assailant and having to touch and pull the trigger simultaneously. For now, I hope that the assailant would be running away when seeing the test fire, or I would be in trouble, even with the stun baton.